if it is standard gauge, i would say it should be about 1:7.5 scale. 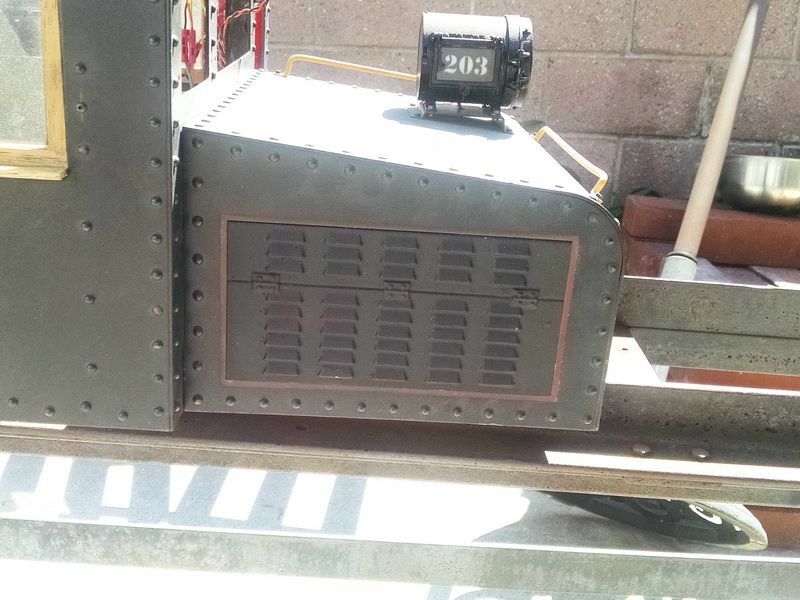 So I've got this generically built, vertical boiler steam engine, that is gauged to ruin on 7.5 inch track. Its big, so I think its bigger than 1.5 inch or 1.6 inch Scale. Trying to figure out the scale. Thought I could do it by comparing it to an LGB Steam Dummy or Tram, but now not feeling quite so sure of that. The spoked wheels are 7 inches in diameter, so maybe that would be the key. Does it matter? Are you going to be putting a scale figure on it, or is this just to answer the inevitable "What scale is it?" question? If the latter, than I would follow your past procedure of just making up a scale that sounds plausible. Great work on the Class A. The Illinois Traction Society Spring Issue 2019 has a complete write up on these units, that they created in their Shop. Would you like a copy of it? Yes I would :). Is there a link for it? I don't think so, send me a private email and I'll mail my copy to you. Ricgolding at yahoo dot com. The rivet counters should be happy .. very nice detail .. Thank you AND they are the "real deal". Solid copper, round head. Each one personally hand-riveted in place. They truly hold the cab together :). I had some time today to do the painting on the aluminum lover door castings. Nice warm day for this work (85 degrees today-sorry East Coast :) ). A couple of photos taken today and the last one, shows one of the lover door panels install on my old Baldwin electric. I had a little file work to do on some of these castings where the sand mold gave way during the "pour". Not too difficult to do with small needle files. I don't think you can notice the "flaws" in these photos. There is a saying in the ride-on hobby.....Painted black and 5 feet away, you'll never notice it! The area around the louver door opening still needs painting (the entire cab body will be repainted and relettered with custom decals from our own Stan Cedarleaf (already purchased) The reddish brown area is where the old louvers were located. 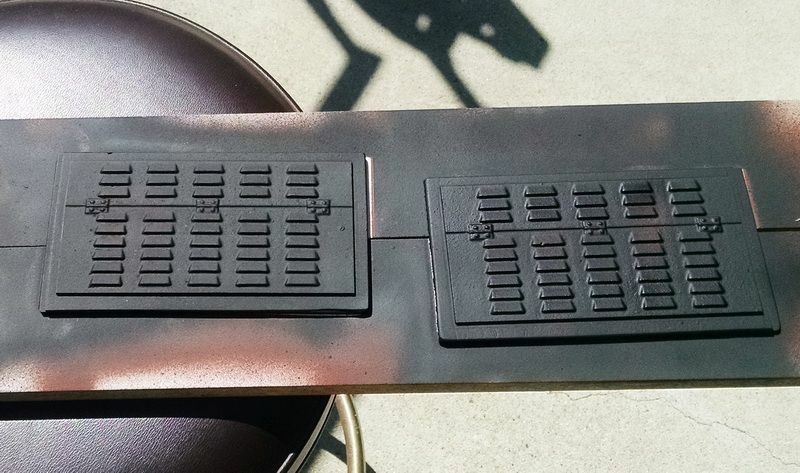 Now to go outside (out of the air conditioned house :) ) and get the other four grills painted. Gary it looks like you're still having fun ... using tools and working on train related things..
Have you been using the line? Do you have a final /to date track plan ? No, I haven't been using the line yet.......BUT the "official opening" will be Saturday April 20th, 2019. The day before Easter. The grandkids will be here for the day :)! We will have both trains running, bi-directional. Should be interesting. 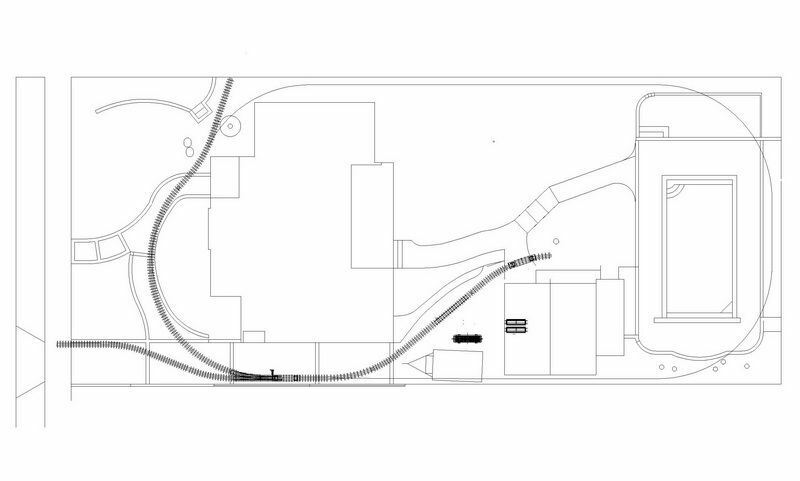 Here is the track plan as of today. Still waitng for the second turnout kit. 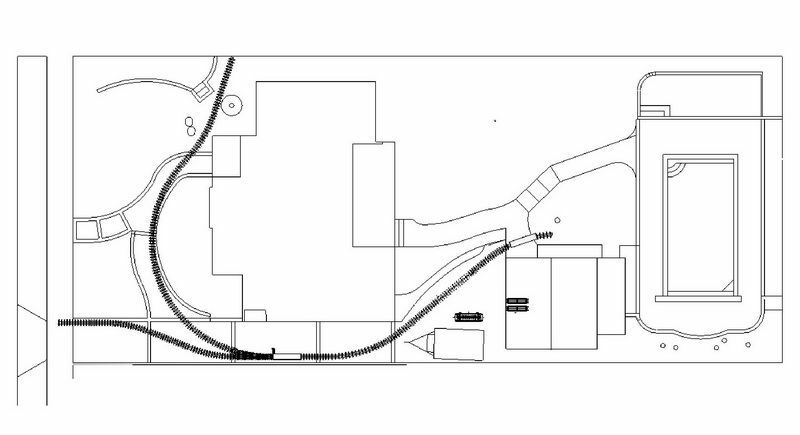 Hasn't arrived yet, but this plan below will use the first #5 turnout as a siding/station spur. The kids can do some switching and trade cars back and forth between the two Baldwin electrics. Should keep them very busy AND they might even learn some things. 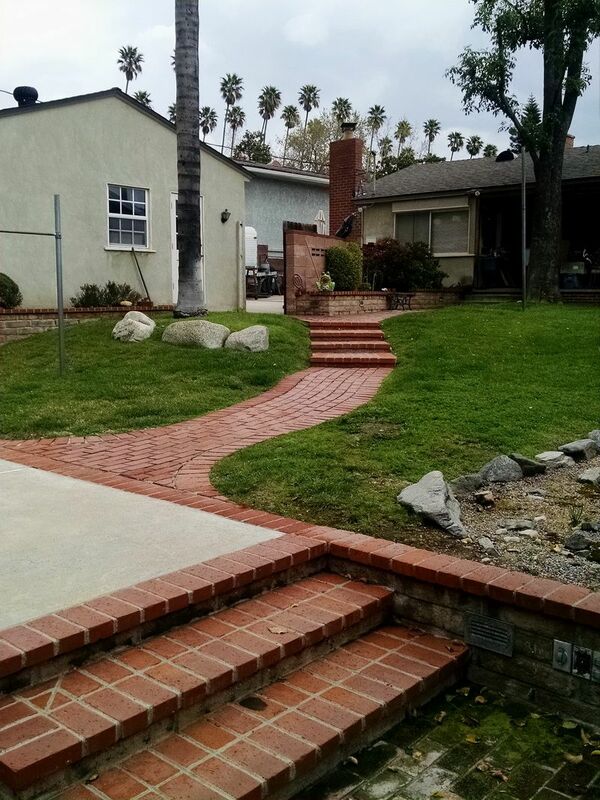 This is a view looking NE across the property showing a large wall on the driveway side and the street and parkway to the right and pool at the extreme left and rear of the yard. The property is now large (a 1/4 acre) 11,000 sq. ft.. But it is on a hillside. The property drops about six feet from the driveway and street down to the rear at the pool. The street is on about a 4-5% slope down from the top of the plan to the bottom of the plan. You might be able to see the 72 inch long steel gondola at the top on the turnout and again at the end of the line in the backyard. Some size comparison. 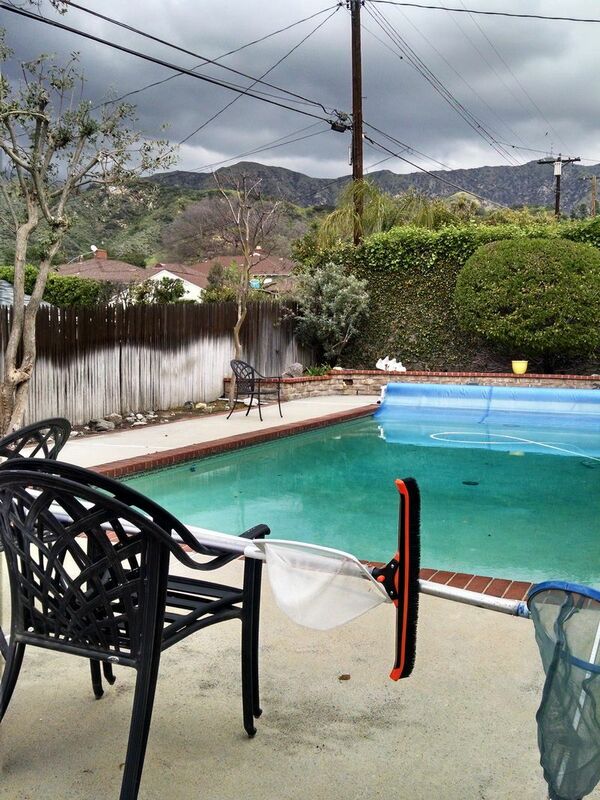 This view is looking from left to right (actually looking southwest) into the San fernando Valley. You can just make out the cinder block wall along the drive and the sidewalk and street in the front yard. The concrete and brick walks are embedded here. 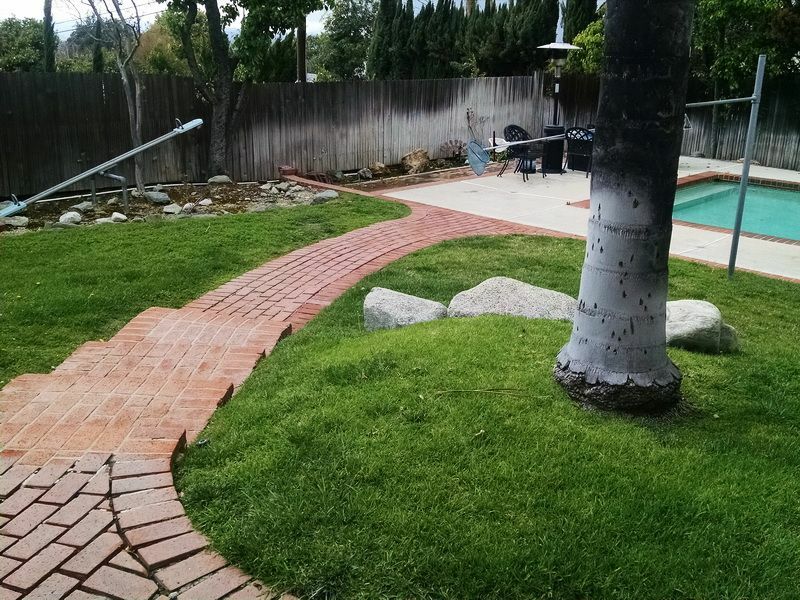 The open space is grass and some retaining walls and steps tpo various levels of the yard. 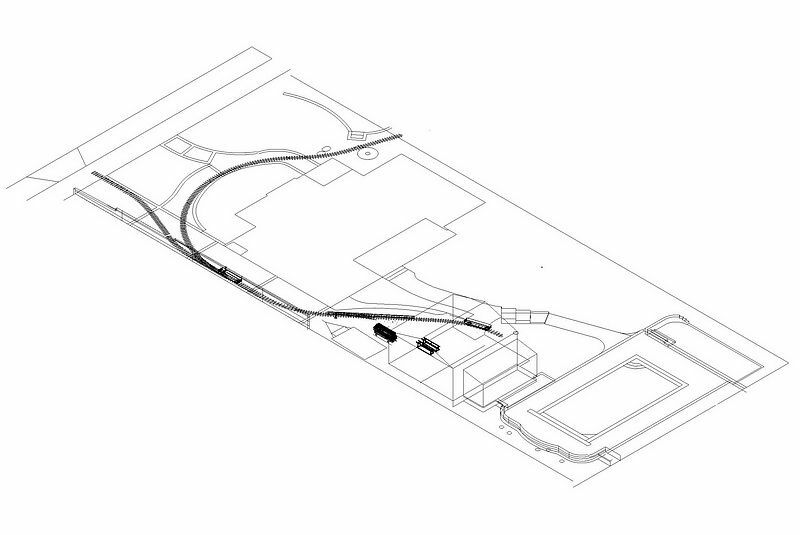 Top view of the layout showing the roughly 230 of track.